$2,890,000, 7 beds, 7 baths, 7080 sq. ft.
At nearly 7080, square feet, this grand Tudor beauty in the coveted San Rafael Hills is as impressive today as when it was built (with no expense spared) in 1926. The skill and artistry of award-winning architect Donald R. Wilkinson, who worked with Reginald Johnson and was chief architect for a noted firm, is evident throughout this gorgeous home. From soaring arched and beamed ceilings to vast oak floors, this is a California interpretation of Tudor elegance, where huge multi-paned casement windows and French doors welcome light in at every turn. The pièce de résistance is the panoramic view sweeping over the treetops to the foothills. Set on a rise, shaded by mature trees, the stately walled and gated residence greets guests with an impressive half-timber style façade topped by mansard roofs and dormers. A covered loggia extends from the drive to the massive front door, inset with Nouveau leaded glass. In the beamed entry hall, your eye is drawn through a wide arched doorway and into an expansive step-down living room with soaring arched ceiling, ending at a huge oak-framed bay window that washes the room with light. In a side sitting area, a full wall of paneled oak surrounds a copper-hooded fireplace. Original details enrich the environment at every turn, from showpiece lighting fixtures, a lavish dining room ceiling medallion and period tile to built-in bookcases, cabinets and niches. Upstairs, a hallway connects six of the seven bedrooms, accented by features like charming dormer ceilings, multi-paned casement windows and window seats. 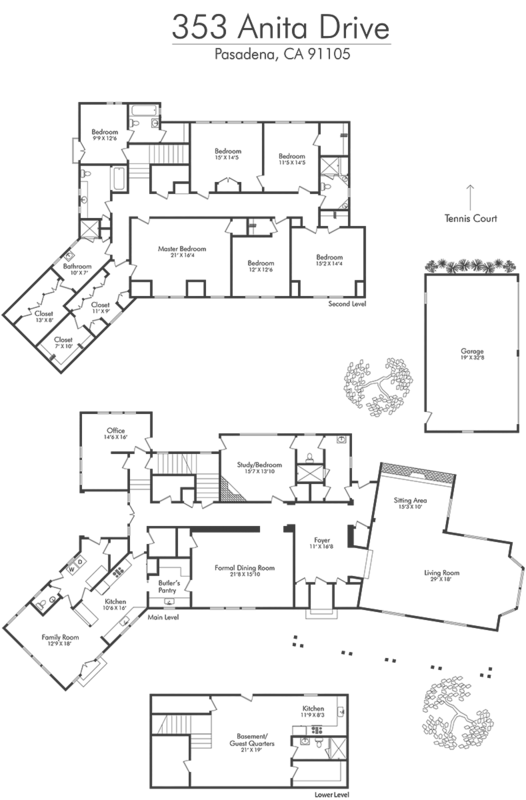 The home also includes a lower level guest quarters with kitchenette and a pretty detached garage. It has been copper piped and was reroofed in 2007. This magnificent estate is just moments from Old Town Pasadena, The Rose Bowl, downtown Los Angeles and major freeways. May be eligible for " Mills Act" status. 1st time on the market in 56 years.